For Advanced Home Upgrade default projects seeking pool pump credit - do not model the base or improved pool pumps in your OptiMiser, Cake, or SnuggPro (or EnergyPro) model. Credit will be given for the pool pump during the processing phase of the project by the program processing. Simply indicate that you replaced the pool pump in the WebApp and provide the required documentation to qualify. If you are submitting your project via the custom path and are utilizing Optimiser or SnuggPro's utility bill calibration option* you may model existing pool pumps only. This will allow the model to calibrate properly. However, pool pump upgrades should NOT be modeled. Credit will be given for the pool pump during the processing phase of the project by the program processing. Simply indicate that you replaced the pool pump in the WebApp and provide the required documentation to qualify. *Utility bill calibration is only availale when submitting projects as Advanced Home Upgrade Custom Path.Utility bill calibration may not be used in projects being submitted to the Advanced Home Upgrade default path. Do you have a project where the utility account holder's primary mailing address is not the same as the premise address of the project? If this is the case, it is possible for checks to be sent to the account holder's primary address when it is not the same as the project address. In order to do so, during post retrofit submission simply indicate via a note in the general notes section that the check mailing address is different and include the correct mailing address for the check instead. When incentive checks are addressed to the contractor, only one address may be used per contractor account. If your address changes it should be updated as soon as possible to ensure the checks that have been assigned to you arrive without a problem! If you have an address update or question, please contact your account management team. As a reminder, projects submitted using Cake Systems are required to be custom path projects. In previous newsletters guidance was provided that Participating Contractors should use recovery efficiency of Domestic Hot Water (DHW) systems and measured efficiency for Furnaces when modeling the existing condition in a home. Please see the table below to determine which input to use for existing values based on the conditions present for DHW, Furnace, Blower Door Testing and Duct Testing that may preclude you from determining the custom value. **Reasons a Furnace cannot be tested may be due to: Furnace(s) may be non-operational, and testing cannot be conducted. There could be other safety concerns that prevent the Furnace from being tested in the pre-retrofit stage such as a cracked heated changer, a disconnected vent pipe, or rodent feces. Manufacturers may also prohibit the system's B-Vent to be drilled, or contractor's testing equipment may not be capable of measured efficiency testing. The BPI Building Analyst form has been updated to reflect the QA/QC Inspection Guideline changes that went into effect April 1, 2016. All projects signed on or after April 1, 2016 require the updated certification form. How will you know you have the correct form? The up to date form shows that it was updated in 2016 in the bottom right hand corner of the page. The new form can be accessed in Program Resources > SCE/SoCalGas Program > Project Processing Documents or SoCalGas Program > Project Processing Documents. The new BPI BA Certification Form will be available for use in both programs. You no longer need to match the form you are using to the program the project is submitted to for this document, as it is a one-form-fits-all document! Simply have your BPI BA complete the pre and post retrofit forms and submit the form at post-retrofit submission regardless of project territory. Important Note: This is applicable to only the BPI BA Certification Form--Incentive Applications should always match the appropriate utility providers. Furthermore, the SoCalGas BPI BA Ambient form should only be submitted to the SoCalGas Home Upgrade Program when applicable. Join the Home Upgrade team to learn Hands-On Mechanical Ventilation skills. The class is limited to ten attendees--reserve your spot today! The address for the class will be provided after successful registration for the event. Becoming a Building Performance Institute (BPI) Building Analyst (BA) will help you expand your knowledge of building science, home performance, diagnostic testing and more, and will allow you to perform Energy Upgrade California® Advanced Home Upgrade projects! The Southern California Edison and SoCalGas® Energy Upgrade California Home Upgrade program offers Participating Contractors the opportunity to participate in BPI BA training and obtain certification at a discounted rate. Contact your account manager for registration details. Specific topics will be announced soon! Do you work in the Madera or Tulare counties? Would you like to learn about a way to close more deals? The California Hub for Energy Efficiency Financing (CHEEF) is launching the Residential Energy Efficiency Loan Assistance Program (REEL) aimed at providing attractive financing options to help residential customers complete more energy efficiency home improvement projects. For more information about this program view details here! Gain access to free training opportunities with BPI CEUs! Register today--seating is limited to the first 30 contractors! To register for this free training, email The CHEEF team with your business name, phone number and contact person to cheef@treasurer.ca.gov. You provided feedback, and we listened! The EnergyPro sunset date has been extended. Newreservations modeled using EnergyPro will be accepted until further notice. During the interim, the program will continue to provide training materials to aid the transition from EnergyPro to your new software choice. As a reminder, the new acceptable software choices are: SnuggPro, CakeSystems and OptiMiser. Please inform us as soon as possible which software vendor you are planning to switch to. Let your account manager know or respond here. Please provide your input by April 8 as it will allow the program to better support you with training and other valuable resource materials. Upon review of CakeSystems Version 1, it has been determined by the program that it is not appropriate to utilize within the default path. Moving forward, only custom jobs will be accepted for CakeSystems projects with Version 1. The program will reassess Version 2 of CakeSystems for use within the default path this summer when Version 2 is released. If you are currently using CakeSystems Version 1 please cease modeling projects using default. Do you currently have some CakeSystems default projects that are modeled or tested-in? Your account manager will be reaching out to you to provide guidance. When modeling with CakeSystems using the custom path, you will need to determine the steady state efficiencies for domestic hot water system and measured efficiency of the furnace instead of utilizing Energy Factor and AFUE (respectively). Please reach out to your Account Manager with any questions or for more information on the software options. Greetings to all Participating Contractors from your Southern California Edison (SCE) and SoCalGas® Energy Upgrade California® Home Upgrade team! Thank you to everyone who attended the March Technical Training workshop last week. The slides are available for download in the Resources section of the contractors' website. Beginning today, April 1, Variable Speed Pump Consumer Rebates of up to $100 on IntelliFlo® and IntelliPro® 2 VST Pumps are available for your customers ($50 on all other IntelliFlo and IntelliPro Variable Speed Pump models which includes VS, XF, VF, VS+SVRS, and i1 models). For more information and details about this promotion please click here. Meet & Greet with Valley Oak Credit Union & REEL Program Training Session: Do you work in the Madera or Tulare counties? Would you like to learn about a way to close more deals? The California Hub for Energy Efficiency Financing (CHEEF) is launching the Residential Energy Efficiency Loan Assistance Program (REEL) aimed at providing attractive financing options to help residential customers complete more energy efficiency home improvement projects. For more information about this program view details here and be sure to join us for our Meet & Greet. Direct Mailer - targeting approximately 150,000 residential customers with a high propensity to participate in Home Upgrade based on age of home and other demographic information. Upcoming SoCalGas Marketing: During the months of April and May, SoCalGas will promote the Home Upgrade program as well! Bill Insert - targeting 3.9 million residential SoCalGas customers. The bill insert features information on Home Upgrade in both English and Spanish. These bill inserts will hit customer mailboxes April 1 through April 30. Email blast - during May, SoCalGas will distribute a targeted HTML email to customers promoting the program. In addition, SoCalGas is currently developing a comprehensive media plan to promote Home Upgrade to targeted customers. Stay tuned for additional details! EnergyPro Extension Date: You provided feedback, we listened! The EnergyPro sunset date has been extended. New reservations through EnergyPro will be accepted until further notice. During the interim the program will continue to provide training materials to aid the transition from EnergyPro to your new software choice. As a reminder, the new acceptable software choices are: SnuggPro, CakeSystems and Optimiser. Please tell us which you are planning to switch to here. New Inspection Guidelines: Check the Program Resources section for the NEW QA/QC inspection guidelines. Join Valley Oak Credit Union and learn about the REEL Program benefits available for both you and your customers! Learn to close more deals and expand your customer base, receive up to $7,000 in co-op marketing funds, get featured on the statewide Energy Upgrade California website, and gain access to free training opportunities with BPI CEUs! Greetings to all Participating Contractors from your Southern California Edison (SCE) and SoCalGas® Energy Upgrade California® Home Upgrade team! Below, you'll find information about upcoming training opportunities with the program, as well as an update from the CakeSystems software team. Home Upgrade Learning Center: Are you a BPI Building Analyst interested in gaining more CEUs? Are you new to home performance and would like an introduction to building science? Interested in transforming your business from HVAC to Home Performance? Exploring new marketing and sales skills? The Home Upgrade Learning Center offers a growing selection of training courses and resources to Participating Contractors in order to enhance your participation in Home Upgrade in the SCE and SoCalGas service territories. After registering, you will be able to browse courses, add them to your course list and undertake self-paced training on your own schedule. Access the Home Upgrade Learning Center here. If you need your access information, please contact your account manager. Have a topic you would like to have added to our learning center? Email Hannah Laughlin. Modeling Gas Fired Wall Furnaces with CakeSystems Software: CakeSystems software can model gas fired wall furnaces; however, there is not currently an input choice for this type of heating system. In the screenshot below, you will see the correct way to enter a gas wall furnace. This combination of inputs will negate the duct distribution from a forced air gas furnace so that it models as a stand alone radiant system. Gas wall furnaces will be included as an HVAC option in CakeSystems Version 2. Participating Contractor Survey: If you have not done so yet, SCE and SoCalGas Program Management would like to request your participation in a very brief survey regarding your participation in the program. Your feedback will help us as we plan training opportunities and events for you in 2016! Join your Southern California Home Upgrade team for a fun night of networking with other Participating Contractors. Meet potential partners to work with you on Home Upgrade projects in 2016! Becoming a Building Performance Institute (BPI) Building Analyst (BA) will help you expand your knowledge of building science, home performance, diagnostic testing and more, and will allow you to perform Advanced Home Upgrade projects! The SCE/SoCalGas Home Upgrade program offers Participating Contractors the opportunity to participate in BPI BA training and obtain certification at a discounted rate. Contact your account manager for discount details, as a special code will be required at registration in order to qualify. Join us for Technical Training! More information about the specific topics to be covered will be available soon. The Home Performance Coalition has announced that they will award 75 contractor scholarships to attend the ACI National Home Performance Conference in Austin, thanks to a grant received from E4TheFuture, a non-profit organization dedicated to strengthening the home performance industry. Applications must be received by February 19. Greetings to all Participating Contractors from your Southern California Edison (SCE) and SoCalGas® Energy Upgrade California® Home Upgrade team! Below, you'll find information about upcoming training opportunities with the program, as well as information about scholarships available for the ACI National Conference coming up in April in Austin, TX. 2016 Communications: During 2016, we're planning to send communications to Participating Contractors twice a month, on or around the 1st and 15th of each month, with longer formal newsletters coming your way in January, March, May, July, September, November and December. We'll keep you up-to-date on training opportunities, industry events and other topics of interest. We will also send occasional updates on special events and any topics that need to be communicated right away. Please make sure that everyone at your company who should receive these updates is on our contact list - feel free to send additional email addresses to your Account Manager. Federal Tax Credits: We'd also like to share some exciting information about the renewal of Federal Tax Credits for Consumer Energy Efficiency. These 2016 Federal Tax Credits are good through December 31, and can help offset the cost of energy upgrades even further for your customers! Follow the links below to learn about the Tax Credits available for certain products. And, as always, make sure to inform your customers that they should speak to their tax advisor about any tax credits they plan to claim. Participating Contractor Survey: Finally, SCE and SoCalGas Program Management would like to request your participation in a very brief survey regarding your participation in the program. Your feedback will help us as we plan training opportunities and events for you in 2016! Join the Home Upgrade team to learn how to perform positive pressure blower door session. Classes limited to ten attendees - reserve your spot today! Happy New Year! Before we dive in to 2016, we'd like to take a look back at the incredible results and impacts of your work last year. You, our Participating Contractors, are the reason for the great success of the Energy Upgrade California® Home Upgrade program in the Southern California Edison (SCE) and SoCalGas® service territories during 2015. Combined, the energy savings impacts of the two programs are equivalent to removing the Greenhouse Gas Emissions of more than 6 million miles driven by passenger vehicles or the Carbon Dioxide produced by the gasoline in 40 tanker trucks. In a place like the greater Los Angeles area, these impacts are important for the health and safety of our community now and for future generations. Pat yourselves on the back - you've created jobs, helped put money back into the local economy, provided safer, more comfortable homes for your customers and made a positive impact on the environment. Here's to even more success in 2016! Lighting Innovations Program Coming to a Close: Up to $300 in select LED lighting products are available for SCE/SoCalGas Home Upgrade jobs of 150 points or greater through the SCE Lighting Innovation Program through February 29, 2016. 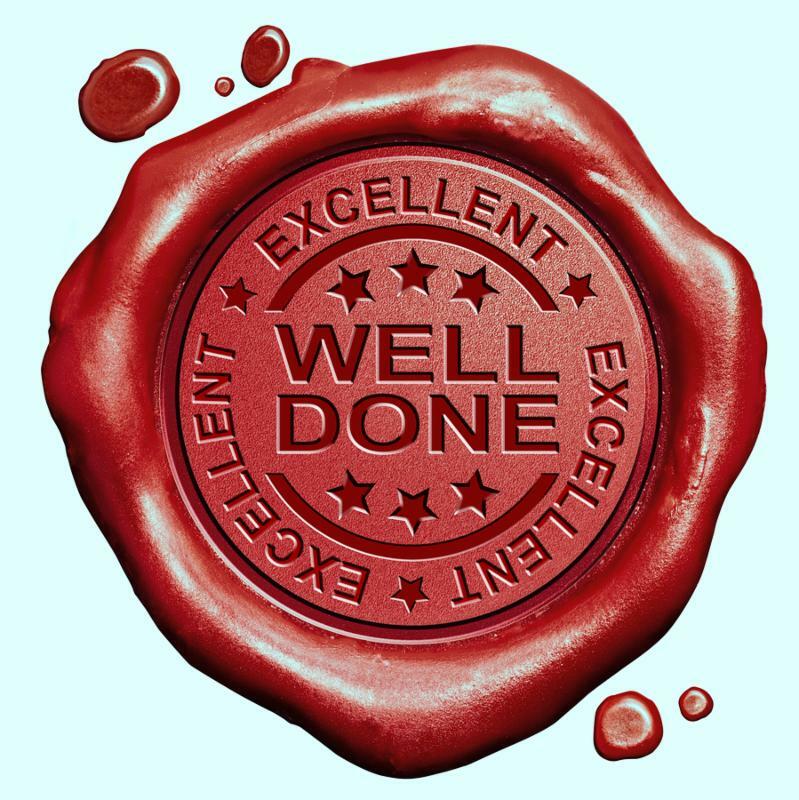 Please submit projects by February 15 to allow time for validation and issue of a voucher. Just enter American Lighting or Walters Lighting in the promo code area, and be sure to have your customer sign the Program Agreement. Upload the Program Agreement with your pre-retrofit project reservation in the WebApp. Contact your Account Manager with any questions, and remember that this program offering comes to an end on February 29. Incentive Application Form Update: We are pleased to inform all Participating Contractors that the 2016 Incentive Application Form (Version 9) is available for download on the program website! Please begin using the new Incentive Application Form immediately for all new projects. Blower Door Testing Procedure Clarification: The positive blower door test is the default test method for Energy Upgrade California Home Upgrade (this applies to both the SCE/SoCalGas and SoCalGas programs). Please be aware that this is how all homes should be set-up and tested in this manner unless circumstances prevent a contractor from doing so. For clarification on positive blower door testing procedures, please see Section 7 Energy Upgrade California Home Upgrade Program QA/QC Inspection Guidelines. For an opportunity to brush up your skills with hands-on training, please see our Training section below. Quality Workmanship Silver: Burgeson's Heating and Air Conditioning, Inc.
Quality Workmanship Bronze: Zero Energy Contracting, Inc. Rising Star Award: Burgeson's Heating and Air Conditioning, Inc.
Gold Achievement: NuQuest Industries, Inc. Performer of the Year: Zero Energy Contracting, Inc.
Incentive Application Form Update: The 2016 Incentive Application Forms (Version 9) for SoCalGas and SoCalGas/LADWP projects are also available for download on the program website! Please begin using the new Incentive Application Form immediately for all new projects. Emergency Equipment Replacement: As we enter the El Niño and associated bad weather, you may receive calls for emergency equipment replacement. Don't forget that these customers are still eligible for Home Upgrade/Advanced Home Upgrade incentives - simply complete the normal program process after you have completed the equipment installation. No additional forms or paperwork are required! Fifth Annual Contractor Appreciation Night: Congratulations to the following Participating Contractors who earned 2015 awards from the SoCalGas program! Quality Workmanship Bronze: Precise Air Systems, Inc. Highest Therms Reduction: Zero Energy Contracting, Inc. Rising Star Award: Hackney, Inc. In 2016 there will be changes to modeling software; it is our goal to keep all Participating Contractors informed on the ever-changing energy modeling software marketplace. We will continue to provide updates as we receive them in our bi-weekly updates to Participating Contractors. As always, you can reach out to your Account Manager for individual support in selecting and using energy modeling software. HPXML Uploading to the WebApp is Live: Home Performance XML (HPXML) is a data transfer standard for the home performance industry and has been launched in the SCE/SoCalGas and SoCalGas Advanced Home Upgrade Programs. What does this mean for you? Compatible energy modeling software will now transfer some of the project information directly into the WebApp. This will reduce the amount of data you will need to input because the HPXML will input it for you! HPXML Upload to WebApp Troubleshooting: Are you having trouble downloading and uploading the HPXML of your energy model from the modeling software to the WebApp? Are you receiving an error message when you upload your HPXML to the WebApp? Click the links below to download step-by-step guides on how to download the HPXML and troubleshooting tips for error messages you may receive. kW Calculations: kW calculations are provided by some software vendors, including SnuggPro, and will soon be provided by all of the approved modeling software vendors. Please enter the value of the kW as reported by the software if it is available to you. If the modeling software you are using does not calculate kW for you, please enter 99 in the pre-retrofit kW calculation and 99 into the post-retrofit kW calculation on the energy modeling results pages of the WebApp (for reservation and for post-retrofit submission). If this information is not provided by the vendor or these results are calculated, the program will be making these calculations for contractors. Submitting other numbers into the kW calculation fields may cause an inaccurate estimate of the incentive to be calculated for the Notice of Incentive Reservation. EnergyPro Sunset Date: Last accepted new reservations for projects using EnergyPro will be March 31, 2016. The last day to complete post retrofit submission on EnergyPro modeled projects will be May 31, 2016. A note on switching software after a reservation has been submitted: if you choose to change your energy modeling software from one to another, a new reservation must be submitted indicating the updated software and accurate energy modeling results. Please be sure of the energy modeling software you plan to use for the close-out of the project at the time of the reservation--as the software used at pre-retrofit must match the software used at post-retrofit. Once post-retrofit documentation is submitted, the energy modeling software choice is final and cannot be modified. Non-Approved Measures: In order to provide a more accurate projection of the incentive to the homeowner, only submit energy models that include savings for approved measures. Any measures submitted in the energy model for savings and incentives that are not approved (domestic water heater temperature reduction, for example) will be removed from the model and the savings and incentive will be recalculated. See the SCE/SoCalGas and SoCalGas Incentive applications for a list of approved measures. Interested in still including those measures in the model but not affecting the energy savings based incentive calculation? Ask your AM how to create a new measure without energy savings. This will allow you to show the measure as complete and an accurate incentive estimate to your customer. Guidance on Using Utility Bill Calibration: If you are using SnuggPro, there is an option to submit the utility bill data to aid in the calibration of the model; however, if you plan to submit through the default program you may not use this feature. Instead, you will be using program defaults. View this helpful graphic to determine if your chosen project path allows you to use this feature. The Southern California Home Upgrade team invites you to join us for an in-person workshop on Home Upgrade and Advanced Home Upgrade Project Processing. Breakfast and lunch are on us! We will also be highlighting the new 2016 Incentive Application Form! Greetings to all our Participating Contractors from Southern California Edison (SCE) and SoCalGas®! We are excited to sit back, relax and celebrate your accomplishments during 2015 at our fifth annual Contractor Appreciation Night coming up on December 17 in Anaheim! Additional details and a registration link are below. Make sure to register by this Friday, December 11! Join us for a night of fun, food, drinks, prizes and more as we celebrate your achievements and accomplishments in 2015! We appreciate and recognize all of your hard work and look forward to celebrating your success with you! If you plan to attend, please register by this Friday, December 11. Please make a point to explain to your customers how the QC process works and why it's important. QC inspections can be seen as additional value to homeowners who might be skeptical about having improvements made to their home. As part of that discussion, please inform your customers that they may receive a call from RHA to schedule a QC appointment and that if their project is selected, the inspection must occur in order for them to receive the incentive. Your account manager can help address any customer questions regarding QC. We have created a document that highlights the main QC and processing issues noted by our program staff. Addressing these issues prior to QC inspection will help avoid incentive payment delays. Similarly, knowing the top processing issues that would cause a project to go into Appeal beforehand will help avoid incentive payment delays. Below is a list of the top QC and Processing Issues. For more details about these issues please click here. The Notice of Field Identified Recommendations (NFIR) form was created so you aren't impacted by conditions in the home that are outside your scope of work. Use the NFIR form to make homeowners aware of pre-existing issues that may need to be fixed in the home, but are not required by the program or are not a part of your scope of work (e.g., disconnected exhaust fans and heat producing devices in contact with insulation as defined in the NFIR form). In order to request these two-part carbonless forms, please contact your account manager who will provide them to you at no charge. You asked and we listened: Effective immediately, theproject identifier, the SEHDPS or SEEPPS number, will be printed on all customer incentive checks for the SCE/SoCalGas joint program in order to easily match the customer with the check. To coincide with PG&E and remain consistent statewide with the Home Upgrade program, we are increasing the number of points earned for floor insulation from 40 to 55. This change is effective as of December 1, 2015. REMINDER: Projects that include fuel switching, regardless of any other items included in the scope of work, do not qualify for any incentives under the Energy Upgrade California® Home Upgrade Program through SCE or SoCalGas. Please contact your account manager if you have any questions about this policy. Winter Special Extended to 2016! We're so happy to let you know: incentive levels in areas where SoCalGas provides gas service and electrical service is provided by a municipal utility (ex. Burbank, Glendale, Pasadena, Lompoc, Anaheim, etc.) will continue to be funded at 100 percent of the statewide levels all year in 2016! Be sure to take advantage of this opportunity to sell projects in areas with mature homes that stand to benefit greatly from our program. Home Performance with ENERGYSTAR® is here! The SoCalGas Home Performance with ENERGY STAR addendum gives you the ability to use the ENERGY STAR brand on your own marketing materials. The ENERGY STAR brand currently enjoys nearly 90% brand awareness in the USA - your customers recognize the label and associate it with energy efficiency and quality. If you submit Advanced Home Upgrade jobs to the SoCalGas only program and have not yet signed the addendum, contact your account manager to get your addendum taken care of. After you have signed the addendum feel free to download logos, branding use guidelines and other materials in the Home Performance with ENERGY STAR section on the SoCalGas program resources page. If you've had a customer who expressed interest in the program but has not yet completed their project, we can help! Provide us with the information about your Cold Leads and allow the SoCalGas Home Energy Advisor team to contact these customers, address their questions and hand them back to you if their interest is reignited by the discussion. Contact your account manager for more information. An important part of each project is finding out whether the customer is satisfied with the work and would recommend their contractor to a friend or relative. We are pleased to share the top five performers in customer satisfaction based on projects submitted since January 2015. Congratulations and great job to the following Participating Contractors! Contact the Marketing Team! You can now email the marketing team directly with any questions about co-branding and other general marketing questions or requests. Incorrect settings on DG-700 for blower door test? Not to worry. Hate that sinking feeling when you realize you did not have your manometer set correctly. Unfortunately, you probably didn't realize it until long after you left the home. Looking at the photos of your blower door setup, you see that you had the DG-700 Configuration set to "Open," when in fact the fan was fitted with the "A" ring. Fortunately there is a way to come up with a correct air-leakage value without having to return to the home and re-test: use the Blower Door Manual Appendix B Flow Conversion Tables. 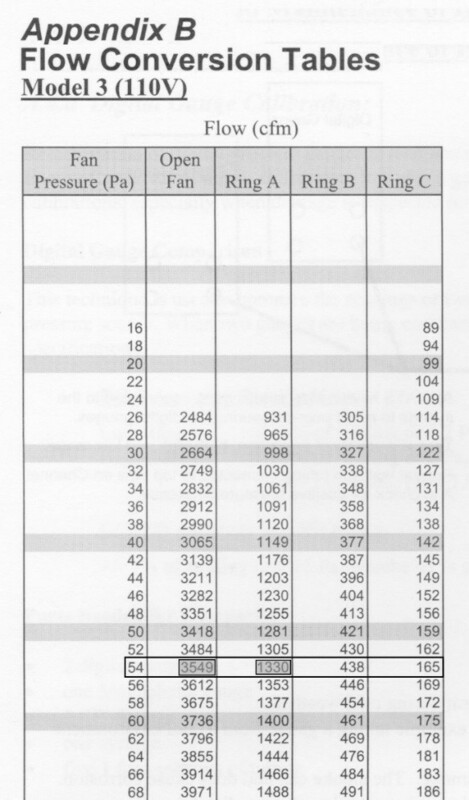 DG-700 Configuration was set to "Open"
In the "Open Fan" column of the conversion table, locate 3549 CFM; this equates to a fan pressure of 54pa. Look to the right in the "Ring A" column to find the correct reading of 1330 CFM. It's that easy. This table can be used for other configurations as well, just locate your values in the proper column and determine the correct value based on how you had your equipment setup. The Energy Conservatory article on this blower door correction is located here. The ability to easily correct for an improper manometer setting is one reason why it is important to digitally capture images of your blower door manometer as well as the actual fan setup. Ideally you could take one image with the manometer in the foreground and the fan in the background. A similar procedure could be used for a Minneapolis Duct Blaster by referring to Appendix B Flow Conversion Tables of the Duct Blaster manual. The Energy Conservatory article on this Duct Blaster correction is located here. For auditors performing blower door testing with Retrotec equipment you can follow a similar procedure found in the Retrotec Blower Door Manual by referring to Appendix B Table 8, beginning on page 60. We are told that Retrotech is in the process of developing a procedure to perform this type of calculation via a software link on their website.